As housing density increases and backyards become smaller, spaces for vegetation are at a premium. More and more homeowners have had into come up with new ways to introduce plants into their properties. We don’t have the same amount of ground space that we used to, so the obvious answer is to go vertical. Green walls and vertical gardens are becoming buzzwords in urban planning and for obvious reasons. Covering our walls in plant life helps to circulate air temperature and improve air quality while also helping to insulate buildings, which carries a double benefit of reducing our carbon footprint while also cutting costs of utility bills. Substantial evidence has also pointed out the fact that engaging in gardening and being surrounded by vegetation has a positive impact on mental health as living Green buildings offers us something to turn to when the cold, stressful urban world becomes too much to deal with. Detractors have pointed out that covering walls in soil and plants could have a negative impact on buildings and lead to their premature decay. This is an entirely unfounded argument, as vegetation protects building materials from direct exposure too harmful UV light and in doing so actually increases the lifespan of buildings. The location of your green wall or vegetable garden will have a lot to do with the types plans you choose. 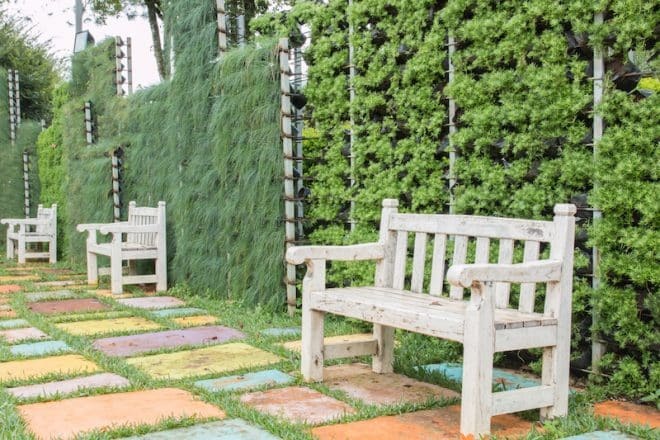 For example, if your green wall or vertical garden is going to be positioned in a cool shady area you’re going to have to choose different plants than if your green wall or vehicle garden was positioned in an area that faces sunlight for most of the day. The best way to choose plants that you can rely on to survive is to talk to the experts at your local nursery. Everyone is well-versed in green walls and vertical gardens so they’ll be able to set you up with the perfect plants for your space. The first thing you need to do is build a frame that you will attach your garden to. Remember to take accurate measurements of the space before you start to build the frame. Wood and steel can be used but they will need to be treated to protect against rot and rust. The most reliable material for a frame is plastic. The design of your frame will be dictated by the types and amount of vegetation you will be using. If you’re going to have lots of levels you’ll need more horizontal framing than if you’re going for climbers. Once you’ve built the frame you need to attach a plastic sheet to prevent any leaking. The foundation is the fabric that your plants will live and grow from. You need to choose a fabric than can retain water and is flexible enough to allow roots to push through. Felt is the most common choice. You need to ensure your irrigation system reaches every part of your wall. The easiest way to do this is to attach a drip system to the top of your wall so it drips down and soaks all your plants. You should always get an expert opinion when selecting pieces for your irrigation system, it needs to be just right or your plants will die so don’t just blaze on ahead. Green walls and vertical gardens are more complex to look after than traditional gardens. The most common problems arise from malfunctioning irrigation systems. However, once you get it working perfectly the wall will essentially look after itself. We recommend getting an expert in to guide you through the installation of your irrigation system and if you notice any plants suffering or pooling of water call the technicians in again to do a check. Like a regular garden you’ll have to a bit of fertilising, weeding and pruning but your maintenance requirements will be dictated by the types of plants you’ve chosen. If you want low maintenance ask your nursery expert about the types of plants that don’t need as much attention. If you want a green wall or vertical garden but don’t have the time or the know-how to go down the DIY-route contact Everlast Services and one of their expert technicians will have one up and running in no time.